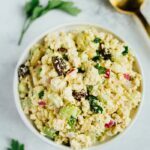 Homestyle vegan chicken salad made with tofu, almonds, celery, onion and raisins tossed in a creamy vegan dressing. 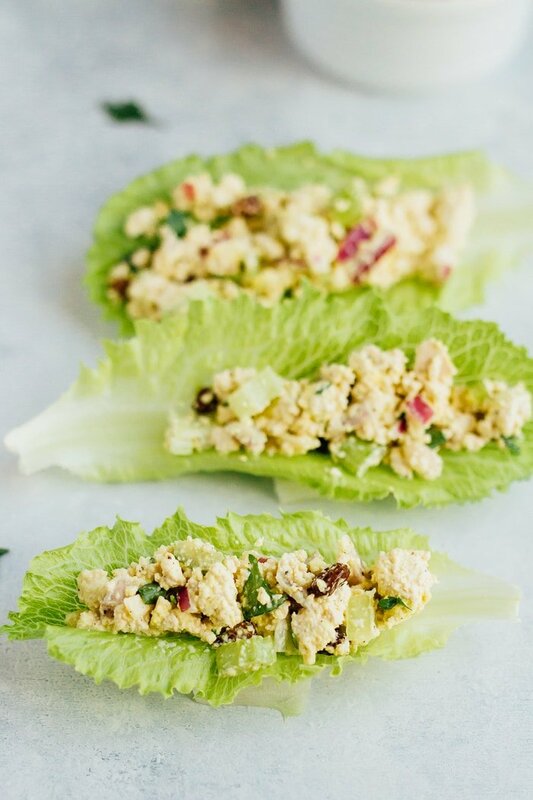 This salad is delicious, protein packed and great for sandwiches and wraps. Vegan and gluten-free. The warm weather has me craving salads again and I’ve even started thinking about a 2017 salad challenge. Last year’s challenge was a total blast with 10 full days of eating delicious salads! Who’s up for salading with me again this year? Let me know in the comment section. Anyhow, let’s chat about today’s recipe! The whole idea for this salad came from a friend. She mentioned that she LOVES the Vegan Chicken Salad from the Whole Foods prepared foods section but that it hasn’t been there in a few months. 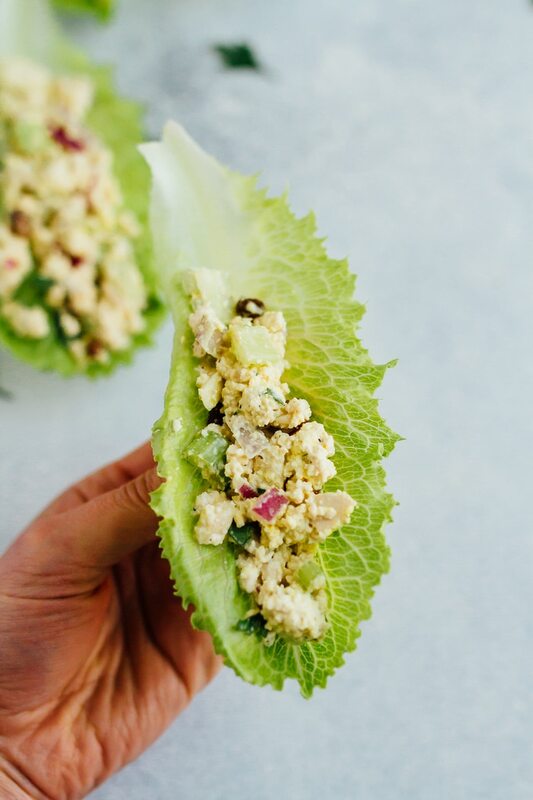 I have a knack for recreating recipes from my favorite spots so I quickly offered to try recreating it so she could make her fav vegan chicken salad at home. After a little research I discovered that there are two different types of Vegan Chicken Salad served at Whole Foods — one that uses soy “chicken” nuggets as the base (meh!) and one that uses tofu. I’m not a huge fan of processed soy products, plus the tofu version seemed lighter and healthier so I went that route. Hopefully it’s the one my friend likes. Fingers crossed. I’ve actually never had the vegan chicken salad from WF but I’m loving this version SO much. It’s loaded with flavor, has a nice crunch and works great for sandwiches and wraps. I even had two meat-eating guys try the chicken salad and they both said it was great, so boom! And on a nutrition side of things, the salad is pretty healthy — the tofu is loaded with plant-based protein so each serving gives you 15 grams! Plus, you’re loading up on all the veggies in the salad as well. There is mayo involved, but as long as you buy a high-quality (no funky ingredients) vegan mayo, you’re good to go. You could also test out making homemade vegan mayo. If you’re not 100% vegan, you could try using avocado mayo, which I really like as well. 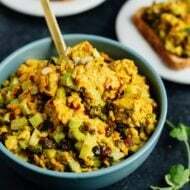 The recipe makes quite a few servings so you could easily make a batch at the beginning of the week and have it on hand for lunch over several days. I loved using it for lettuce wraps or over a bed of greens with some additional veggies, but you could easily put it between two slices of bread or stuff it into a pita as well. It’s such an easy lunch option! 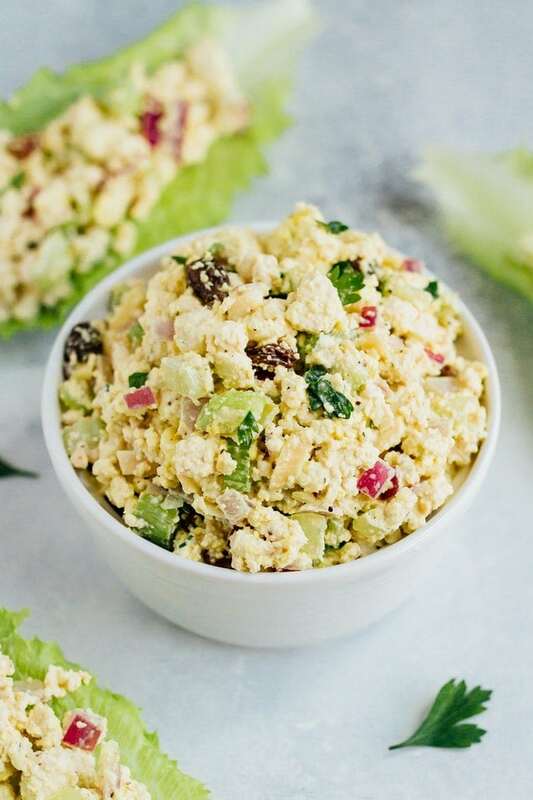 If you make this simple vegan mock chicken salad, please be sure to leave a comment and star rating below. Your feedback is super helpful for the EBF team and other readers who are thinking about making the recipe. Crumble tofu into small pieces in a medium to large size bowl. 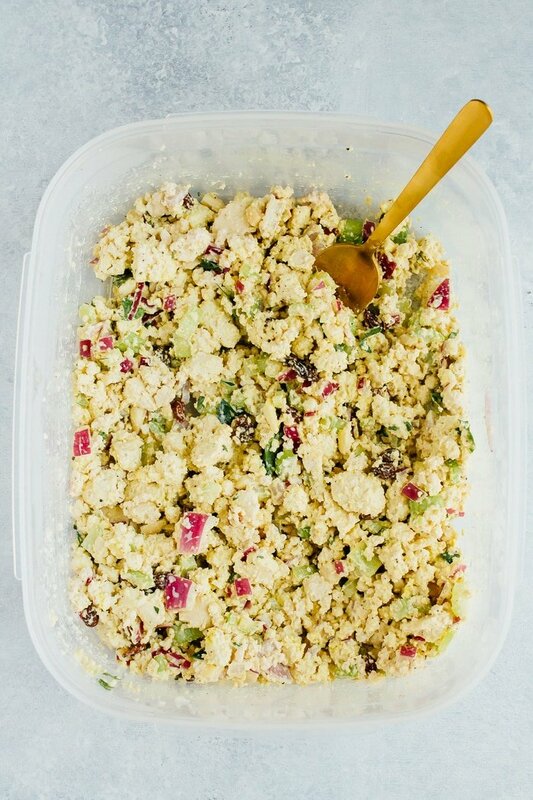 Mix celery, onions and almonds with tofu. In another bowl whisk together the dressing ingredients: mayonnaise, apple cider vinegar, maple syrup, olive oil, pepper, salt, dill and turmeric. Toss fresh parsley and dill on top and give the mixture another stir to combine everything. Add dressing to the tofu mixture and stir well to combine. Enjoy immediately. Leftovers should last 4-5 days in the fridge. PS – I’m a huge fan of using raw red onions in salads, but they can be a bit pungent. If you want, you can remove some of their astringent flavor by soaking them in cold water before adding them to raw salad recipes like this! I’ve never had the Whole Foods version – but with your recipe I won’t have to! I do miss chicken salad from my poultry-eating days. Love this mock salad! 🙂 It looks just as good, but it is made at home and cheaper! Gotta love that! i always loved this dish in college – i’d throw in some raisins too! YES!! I totally wanted to add in some apples or raisins but didn’t have either on hand. I was never a big fan of chicken salad unless it was curried (and with grapes!). Do you think this could be made into a curried version? 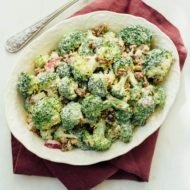 Thanks for the recipe, it will be fun to try, and it’s always great to have recipes that are good for several days’ lunches! Definitely, just add curry powder and grapes! 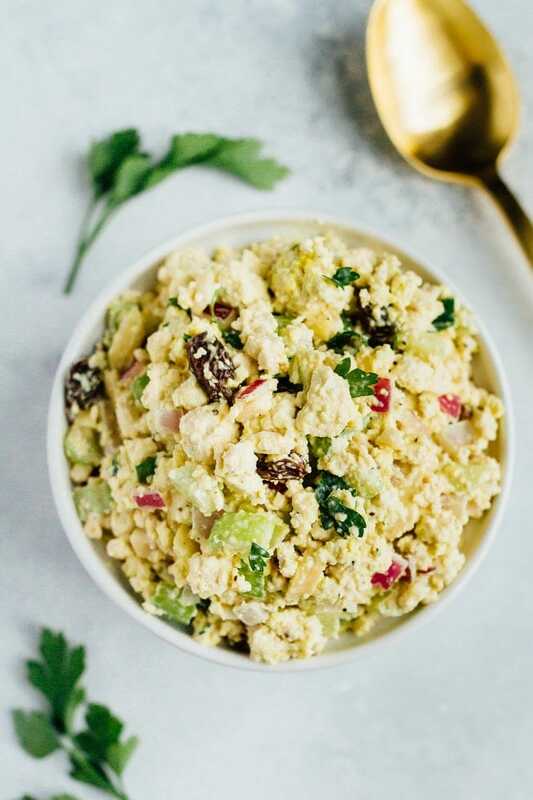 I make mock chicken salad with chickpeas and it’s great! I want to try this!! Ill have to scope it out at whole foods. Britt, Im vegetarian now! 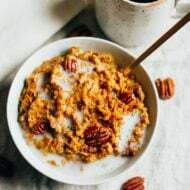 I will eventually be going vegan but I still cant seem to give up milk and cheese yet 🙁 I am trying out some vegan things now to prepare me for the transition…this recipe will surely help! I like your version but I had to tweak it to make it more like my traditional upbringing. I added 2/3 c. Vegenaise, 1/3 c. Tofutti Sour Cream, and 1 t. Altius Greek Chicken Seasoning. I also changed the texture of the tofu by freezing it after pressing it. It was great! I think in the future I’ll cut the scallions in half and add grapes! That looks really refreshing. Adding it to my list! How have you been? I’ve been so out of the loop with blog reading – but I’m back and raring to go now 🙂 I’ve missed reading your posts – glad I visited today. I’m doing well. Your new blog looks great! Thanks for visiting Rose. I love when you recreate the Whole Foods menu…they are too far away for me to go their to eat often so I need an alternate. Thanks for posting this! This has gotta cost less than $8.99/lb!! yUM!!! You or your friend might want to ask if they might give you the recipe or if they will bring it back and then you can use the ingredient list on the side. 🙂 At the whole foods I frequent they are pretty good about responding to shoppers’ questions and comments. This sounds tasty though I might opt for vegan mayo since chicken salad to me usually means yummy, creamy mayo. I think this could also be interesting with chunks of chicken-style seitan. THANK YOU for not using veganaise, I was looking for one that used tofu (just because thats what I have on hand) and this is the only one i’ve found so far. Can’t wait to try it! I’ve never tried the WF mock chicken salad, but I LOVED Elwood’s when I lived in RVA. I usually make my own now. Can’t wait to try this recipe out! Wow, this looks and sounds great! As a vegetarian, I’m always looking for easy, healthy, meal ideas and I love the easy ingredients this has in it! Plus, it looks super flavorful! Well this looks delicious, I think I will make a batch for lunches next week. I would totally be down for a salad challenge! Do it! I’ve been eating a batch all this week! So good! I don’t like tofu but have to make a vegan meal this Sunday so this is perfect timing. Thank you so much. Here is a silly question. Is the tofu in this salad really not cooked? WOuld love another Salad Challenge! Your last one was so great! I would love a repeat of the salad challenge this summer! That was fun. 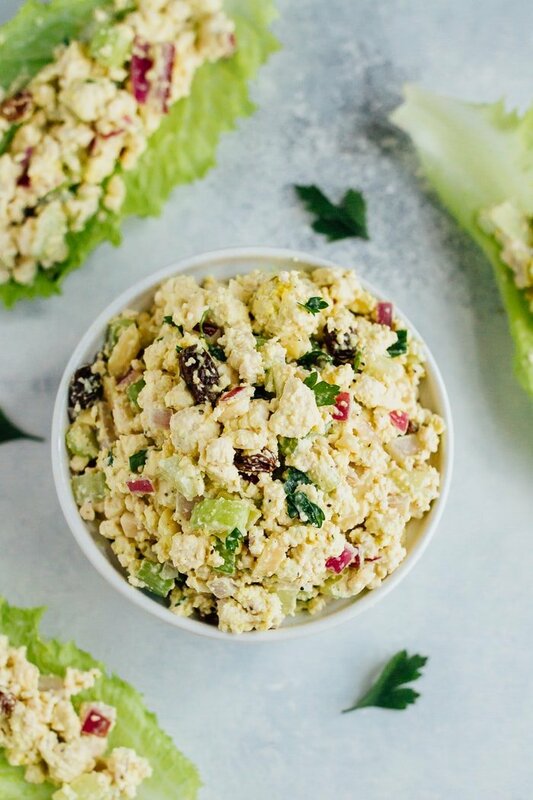 I love chicken salad, but this looks like a yummy and easy alternative, because you know, you don’t have to cook the chicken ???? This looks amazing, me boyfriend won’t even be able to tell it’s vegan! Can’t wait to add this to my weekly meal plan. Inspiring! I like the combinations and the use of firm tofu. Looks delicious! This looks wonderful, love the ingredient list and that it works so well with tofu. Thanks! Can the oil be left out? What do you think the result would be? I think it would be okay with the oil. Not as creamy, but it will still taste great. Try it and let me know what you think! i made this having never done anything with tofu before and it was f%$&cking delicious! I too love WF chicken salad. For vegetarian I used Quorn chicken cutlets and shredded them. I will be adapting my recipe with your dressing.